Thank you for supporting us! We look forward to opening again in Spring 2019. We are excited to announce that we will be reopening for the 2018 season on May 10th! 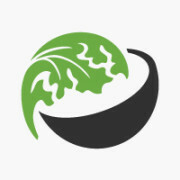 http://www.thesaladbowlobx.com/wp-content/uploads/2014/03/saladbowl-blog-default.jpg 200 200 chefgcp http://www.thesaladbowlobx.com/wp-content/uploads/2014/03/saladbowl-logo-horiz1.png chefgcp2018-04-18 13:57:132018-04-18 13:57:13Opening for 2018 on May 10th! We are excited to announce that we will be reopening for the 2017 season on April 25th! http://www.thesaladbowlobx.com/wp-content/uploads/2014/03/saladbowl-blog-default.jpg 200 200 chefgcp http://www.thesaladbowlobx.com/wp-content/uploads/2014/03/saladbowl-logo-horiz1.png chefgcp2017-04-06 11:18:352017-04-06 11:18:35Opening for 2017 on April 25th! 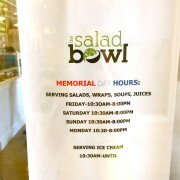 The Salad Bowl is closed for the winter. Thank you for a great season! See you in Spring! http://www.thesaladbowlobx.com/wp-content/uploads/2014/03/saladbowl-blog-default.jpg 200 200 chefgcp http://www.thesaladbowlobx.com/wp-content/uploads/2014/03/saladbowl-logo-horiz1.png chefgcp2016-11-14 14:23:572017-04-06 11:20:31Thank you for a great season! See you in Spring! We are Open for 2016 ! Hello Everyone. We are excited to announce we are open for 2016! Our Spring hours are 10:30 am – 3:00 pm right now. http://www.thesaladbowlobx.com/wp-content/uploads/2014/03/saladbowl-blog-default.jpg 200 200 chefgcp http://www.thesaladbowlobx.com/wp-content/uploads/2014/03/saladbowl-logo-horiz1.png chefgcp2016-03-24 13:48:422016-04-19 12:52:36We are Open for 2016 ! It’s Back… Chicken Noodle Soup! 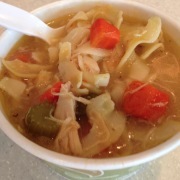 It’s back… our yummy chicken noodle soup! Come on in and get a bowl. It’s guaranteed to help those summer colds, end of the summer tiredness or just feed that craving! http://www.thesaladbowlobx.com/wp-content/uploads/2014/10/screenshot_03.jpg 656 851 chefgcp http://www.thesaladbowlobx.com/wp-content/uploads/2014/03/saladbowl-logo-horiz1.png chefgcp2015-09-03 11:09:432015-09-03 11:09:43It's Back... Chicken Noodle Soup! In honor of our nations birthday we will be closed Saturday, July 4th. Happy Birthday America! 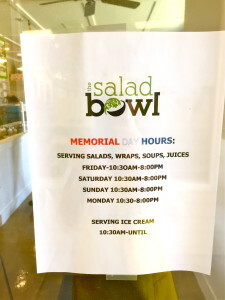 http://www.thesaladbowlobx.com/wp-content/uploads/2014/03/saladbowl-blog-default.jpg 200 200 chefgcp http://www.thesaladbowlobx.com/wp-content/uploads/2014/03/saladbowl-logo-horiz1.png chefgcp2015-07-03 09:59:442015-07-03 10:08:08Happy 4th of July! 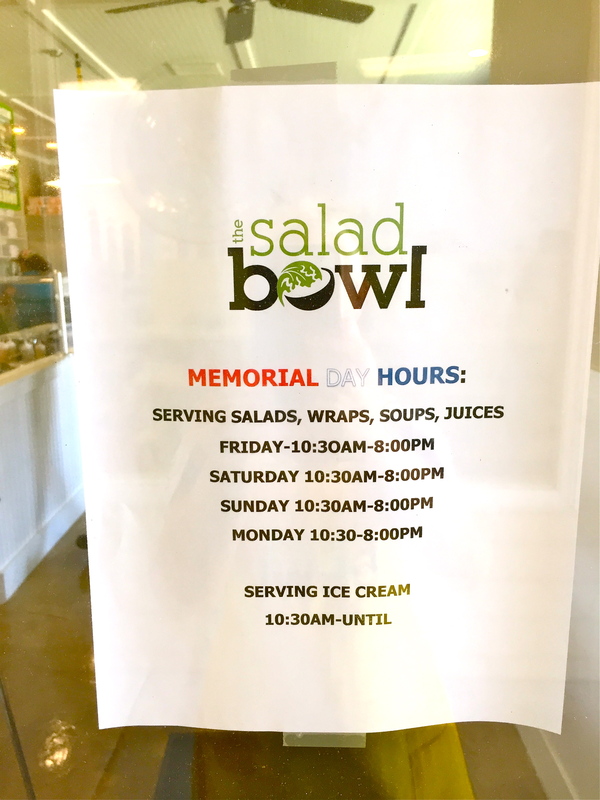 Serving Delicious Salads, Wraps, Soups, Juices, Smoothies and Ice Cream 10:30am – 8:00pm over the Memorial Holiday Weekend.